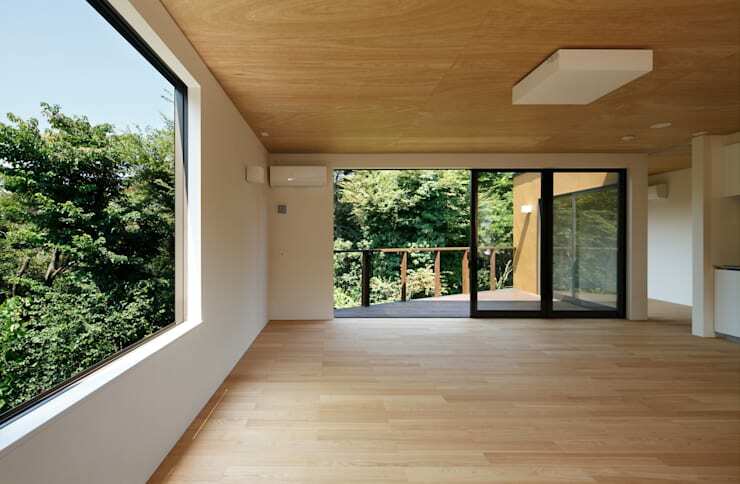 This simple yet stylish abode is brought to us by Japan's Mukoyama Architects, and presents an inventive approach to a modern home built with limited space available. Constructed on a mere 93m2 block, the striking, bi-level house is cradled in lush, green parklands, and incorporates ample room to house a vehicle on the ground floor, with a studio-style living space perched upstairs. From the outside home presents an intriguing facade, with its caramel brown hue glowing out onto the street, cradled in the vibrant green of the parklands flowing behind. 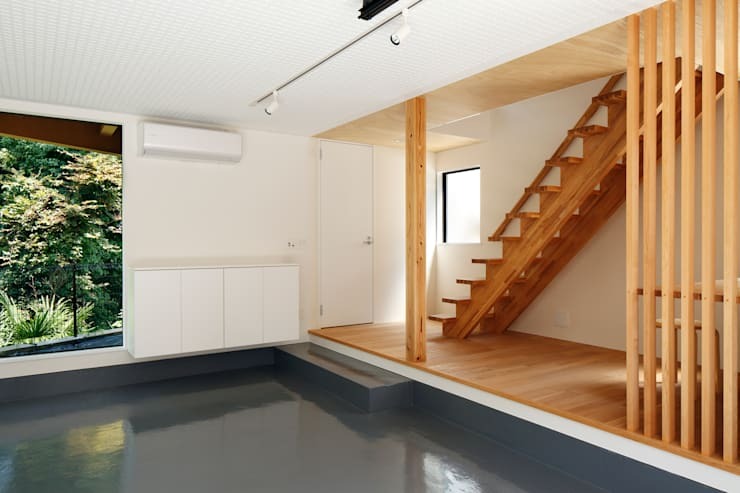 Upon entrance we're met with an open and spacious design, with the ground floor housing a garage and small study, and a simple wooden staircase inviting exploration of the upper level. The first floor is once again impressively spacious and open in its design, with a modern mix of wood and white decor characterising the interior, and a compact kitchen and semi-enclosed bedroom completing the effect of a studio dwelling. The crowning jewel of this home however, is its generous stretch of external decking, which capitalises on a picturesque view of the parklands beyond, and bathes the interior in the refreshing serenity of nature. Take a tour of the images below and see what you think! 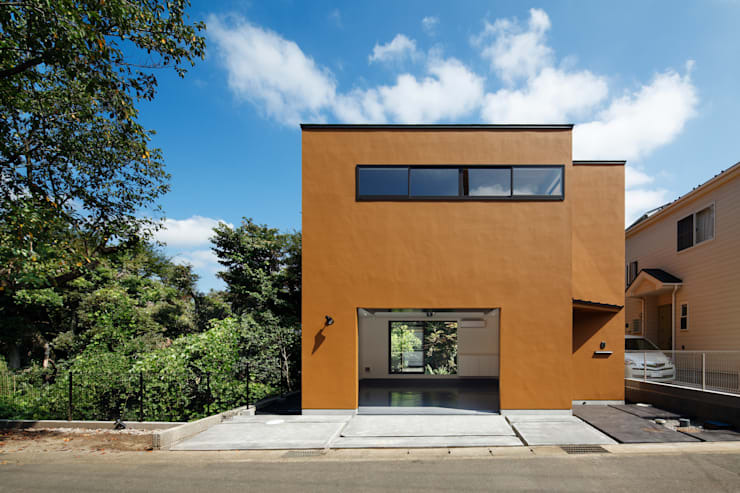 The exterior of the home glows in a warm, caramel brown, with its cubic facade presenting a striking departure from the neighbouring architecture. The house has been constructed in a prime location, perched atop a concrete dais overlooking an expansive stretch of lush parklands. From this perspective we immediately gain a sense of the home's open interior, with a vibrant burst of green streaming over its expansive rear decking, through the windows, across a spacious floor plan and out the garage door. The interior of the home emulates the understated, modern air its facade, with white walls and ceilings grounded in woodgrain and polished concrete creating a stylish lower level, with ample space to house a vehicle. In the distance we can see the beginnings of a small, rear deck, which provides a vantage from which to admire the picturesque greenery beyond. Light flows into the home through an array of windows, while a simple, wooden stairwell leads to the home's upper floor. 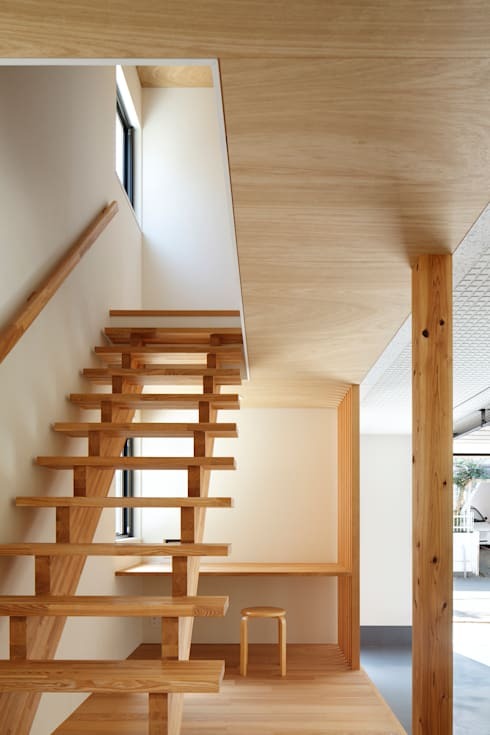 Beneath the wooden stairwell and surrounded by strong, wooden beams this simple alcove has been built, presenting a small area for work or study. The alcove is a clever addition to a home with limited space available, capitalising on the area beneath the stairs to create a stylish space in which to quietly undertake daily tasks. This vantage lends insight into the wonderfully open design of the upper level of the home, which is flooded with natural light during fine weather. The expansive area provides plenty of room to house a collection of living and dining furniture, while a generous array of windows illuminate the abode from all angles. Large, sliding glass doors beautifully amalgamate the indoor and outdoor areas of the home, taking full advantage of the refreshing effect of its natural surrounds. 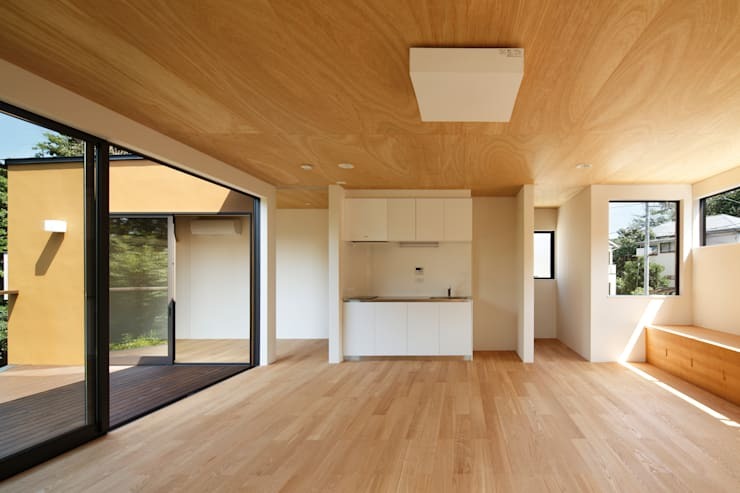 Did you enjoy the inventive simplicity of this lovely home? Have a look at A Secret Japanese Garden and Home for more inspiration! Moving through to the upper level of the home and we're met by a flowing expanse of timber lining both the floors and ceilings of the space. White walls and large windows break the effect of the streaming woodgrain, with the upper floor beautifully lit by sunshine. The kitchen has been kept compact and contemporary, with its white and stainless steel finishes presenting a simple space for food preparation and storage, while a large deck juts proudly out over the parkland, providing space for outdoor living amidst the picturesque scenery. In the distance, we can see a bedroom alcove has been tucked away next to the kitchen. Retaining a view of the parkland, this space is partially sectioned for privacy and completes the studio effect of the home's upper level. What do you think of this modern home? Can you imagine living here? Tell us your thoughts below!